Prednisolone « I Don't Fear The Chaos! Any regular readers or old-time friends who read my blogs will know that I was almost completely absent from blogging last year (2012), and most of this year (2013). For me this is unusual, I can go missing from blogging for weeks or months on end and then come back with something. However, this time I didn’t. The reason for this? I was preoccupied with my University degree and generally being and trying to be healthy. For those people who know me they will know how rare this is as I have several illnesses that impact my ability to do many things and go places. One of the worse of these was Ulcerative Colitis. I was taking Prednisolone steroids to control this in conjunction with Mesalazine. But then I had to switch medication as the medical steroids I was on had given me steroid-induced diabetes (Type 2 Diabetes) and weren’t always delivering consistent results. Since I started taking Azathioprine medication to control the Ulcerative Colitis in late 2011 I slowly got better and it gave me my life back. Now when I say ‘better’ I mean things were good and well controlled but I still had and still do have issues with the UC. In fact after being diagnosed with the diabetes it made me more depressed and this stalled the UC recovery into to early 2012. As the UC was beginning to get better I was able to be more physically active, something I’ve not been able to do properly for a while. I think I was helped along with this when I had a bad bout of OCD, to stop myself from ruminating and worrying I threw myself in to my exercise regime, which is something I badly needed to do as I was 25st (350lbs/158kgs) and had the diabetes to worry about too. I’d gained so much weight because of years of the UC affecting my diet, so many foods I ate, that were good for me, triggered a reaction with the UC. So I ended up eating junk food, which didn’t apparently do anything. Combine that with lack of exercise because that set the UC off too and being housebound and you’ve got yourself the right combination for more health troubles. I started off on the treadmill just walking for half an hour five days a week, it was gentle and not too much hassle. I did however get blisters on both my feet and on my toes because my feet weren’t used to wearing shoes for so long and in such conditions. These were huge blisters too! But I couldn’t take time out, it wasn’t an option anymore, so I just looked after my feet and bandaged them when I went on the treadmill. Gradually my feet got used to it and I started to walk for longer and then jog. I made a game of it, I’d try to jog for that bit longer each time I did the ‘run’ in the run and walk system that I used on there. When I say ‘run’, it was more of a jog for me as running put too much pressure on my back and knees, not to mention the treadmill! I began to develop great endurance and at my best I could jog non-stop for an hour and half. I couldn’t go no more than that because if I did my back would completely give in, I was getting back pain just doing the run and walk system for an hour. During the times I was doing the treadmill I was also lifting weights too, but not too many and not too heavy. I’d set off my back pain doing weights on and off since the age of 16. All this paid off as I went from being 25st (350lbs/158gs) to just under 18st (252lbs/114kgs) from November 2011 to August 2012 (though I only started my proper exercise regime in April 2012). I felt great! I was feeling physically and mentally well, the first time in a long while. Things were going so good I moved out of the family home and was even contemplating getting a part-time job, because despite what some people may say the UK benefit system isn’t that great and I’d rather make my own way in the world anyway. Then came August 2012, the back issues I’d had on and of since I was 16, the ones that made me unable to walk for days and not able to walk properly for weeks, came back! The Doctor who came out to see me diagnosed Sciatica and my GP said the same thing. They gave me pain killers and told me to rest, do some core exercises to help strengthen my back then exercise as usual when back to normal, and if the pain comes back then take some pain killers and carry on. The pain has never gone away and I could not possibly exercise with those pain killers as the amount I’d need to dull the pain sufficiently leaves me really tired and feeling drunk. And lifting weights and jogging when you’re drunk aint such a good idea. I had the issue investigated this year with X-rays and a CT scan, one of the Doctors said I may have Sacroillitis, before the X-rays and CT Scan was done, though I couldn’t see how that could be as Sacroillitis is a problem caused by inflammation caused by inflammatory bowel disease, I know I have that but I’ve only had that since 2005 and I’ve had these back issues since 1999! So that was dismissed by me and my GP who thought it unlikely too. The results from the X-ray and CT Scan came back and there’s a problem there, they can’t say exactly what it is, but it’s there and there’s nothing they can do. They advised me not to jog, run, lift weights or do any exercise that puts pressure on my back. This only leaves me swimming, which I can’t afford as a pass at the local gym is £22 a month which I can’t afford, the only other pool near by is £29, so both are out of the question. Walking is supposed to be good but I can’t walk or stand for more than half an hour anymore without getting a tightening in my lower back, like someone’s stuck a cork-screw in there and is turning it. If try to carry on walking the pain gets worse and spreads down my groin and legs. Despite this I’ve been trying on and off since August 2012 to restart my regime despite what the Doctors and specialists say but I am just incapable of keeping to it anymore, there’s always pain and a lot of the time I’m physically incapable of completing the movements. Without the exercise to release the endorphins (and I really need those guys) I need to help suppress my appetite and generally feel good… I’m slowly putting it back on. So I’ll be starting another diet tomorrow, only 1500 calories, to try drop my weight because it just isn’t healthy at all for me, and I don’t enjoy feeling unhealthy. The most annoying thing is I want to be physically active, but my body just wont allow it. Hence why I wasn’t around much last year or most of this year, because I’ve been trying to stay physically and mentally healthy. Another reason why I haven’t been on much is my University degree. Despite the obvious study, reasearch and writing of notes and essays and the like, there was something else about my course that stopped me from coming on. It’s not that I can’t do or understand the work, I mean I passed the level 2 Philosophy module in my Politics, Philosophy and Economics degree and 2 others, the issue is that I’m learning so much and it makes me even more unsure of my own opinions. What I mean by this is I read a piece of work then think I’ve got it nailed and seen from all angles, then comes along another way to look at a particular issue from another angle I think to myself, “How could I miss that?”. It’s made me quite unsure of many opinions I hold. I mean, if I’m wrong about that I could be wrong about many other things. And in fact, so can many other people. This is nothing I didn’t already know but doing this whole course brings it to the forefront because I’m forced to think about these things a lot. This may sound stupid and cliché, but the more I learn the less I feel I really know. Anyway, it’s this thinking, alongside my obsessive over thinking I do anyway, that tires me out mentally. Combined with illness and medication side-effects I can barely think straight most days, which makes it extra challenging to do the course and put everything I have into it. This is another reason I couldn’t come on, I was just too mentally tired after being consumed in study, reasearch and writing. This piece is the blog I should have come back with instead of my Syria one, which is a bit of a throw back to how I used to write, my other blogs should be well thought out and researched, just like the essays I’ve had to write. And you know what, writing them can be a pain in the arse too, especially as only a few people will even read them. Which is another reason why I wasn’t posting much, because if I do one of my long blogs again many normal people don’t bother much. There’s also the fact my blogging at the world also wont change much. Oh, I didn’t mention my headaches, but they impact my blogging too, but sod them. My next course starts in October 2013, so expect me to go quiet a little but I will still be around commenting on blogs and such. For now I’ll leave you with Bat for Lashes, simply because it’s the song I’m currently listening to. Oh and how cute is Natasha Khan in the video? Day 55 Sun 13th March 2011: Woke up late, but my sleeping pattern is staying consistent for the time being. I didn’t go to the toilet again yesterday, not been today either and it’s 2:22am! Only minor cramps, nothing bad really. 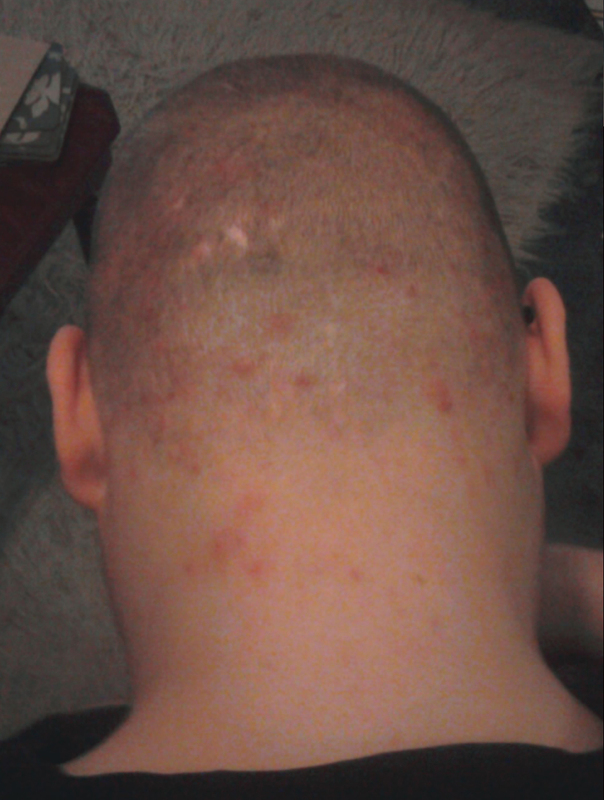 My scalp is still itchy but not as a much as before. OCD not that bad but still feel low. Day 56 Mon 14th March 2011: Not much trouble today, haven’t been to the toilet yet, have no cramps but I feel tired. Then again, I feel tired every day. Fell asleep for two hours because I was tired. OCD and anxiety aint been that bad. Went to the toilet and twas normal.